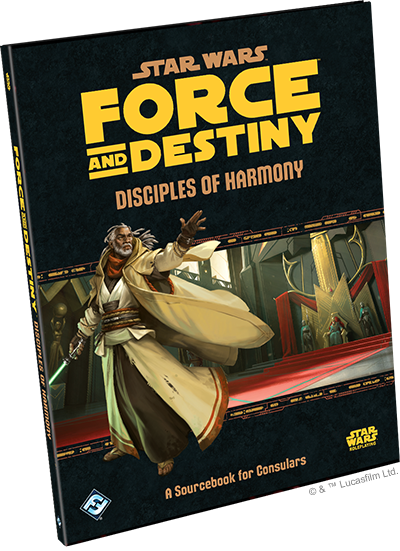 Fantasy Flight Games is proud to announce Disciples of Harmony, an all-new sourcebook for Consular characters in the Star Wars™: Force and Destiny™ roleplaying game! The rise of the Empire and the absence of the Jedi Order may have caused the Jedi Knights to fade into the ashes of history, but there are still those who know the truth, who refuse to allow the Jedi to become the stuff of legend and myth. 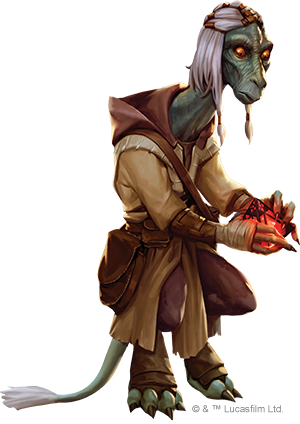 Disciples of Harmony is a sourcebook for Consular characters in Star Wars: Force and Destiny, offering players new insights into the path of the Consular, introducing three new specializations, and making available new equipment and Force powers. The path of the Consular is one of balance, which can lead to difficult choices in more traditional, combat-oriented campaigns. Disciples of Harmony offers Game Masters multiple avenues to incorporate their Consular characters into the adventure without disrupting their dedication to balance and the preservation of life. This supplemental sourcebook includes instructions for establishing mentors and practitioners of alternative Force traditions as well as diplomatic scenarios and adventure hooks that can flesh out a campaign setting and expand it into the wider Star Wars galaxy. The Consular is keenly attuned to balance, walking the path of peace and viewing all life as sacred—this is a dangerous position to hold in a galaxy ruled over by the Galactic Empire. With planets torn apart by warfare and civilizations left in ruin, the Consular's role is more important than ever, following the will of the Force to bring light, peace, and harmony to those they encounter. To be a mediator in a galaxy that is riddled with near-endless conflict is to court bitterness and despair, but the Consular balances the darkness with a never-ending quest for knowledge and understanding of the Force. Disciples of Harmony offers new ways of looking at the Consular path for both Game Masters and players, adding on three new specializations. Arbiters feel the sting of injustice at a personal level and seek to balance the scales for friend and foe, making for an excellent addition to a group seeking to work in local and planetary conflict zones. Ascetics have turned their back on the noise and chaos of the galaxy, denying themselves the comforts of civilized living in exchange for insights and inner strength. Teachers have learned much of the Force and the galaxy around them, desiring to impart what they have learned on others and using their accumulated wisdom to enhance adventurers' innate talents. Players will also have three new species to choose from: the cold and calculating Arkanian, the genial and soft-spoken Cosian, and the ghoulish and gaunt Pau'an. With the Much To Learn and Unmatched Negotiation Signature Abilities and the Imbue and Ebb/Flow Force Powers, your Consular characters should have no trouble making their presence felt without ever needing to wield a weapon. Physical conflict is a last resort for Consulars, but even the most dedicated mediator must be prepared for all outcomes. Disciples of Harmony expands the equipment at the disposal of player characters and Game Masters. You’ll find new ranged and melee weapons are focused around incapacitating any individuals and ending combat, including conflict resolution tools like concussive rifles, spray foam grenades, and riot control batons. Weapon attachments that enhance or disguise a Consular's lightsaber will likely prove invaluable toward achieving a more peaceful resolution. The search for artifacts tied to the Force can lead the Consular into dangerous places, and an Arbiter's quest for diplomacy may lead them to interactions even more dangerous life forms. Disciples of Harmony adds biogel suits, individual field disruptors, formal council armor, and other protective suits to the campaign. In addition to a new arsenal and armory, players will have access to new survival gear, scanning and surveillance equipment, electronics, medical equipment, droids, vehicles, and starships. Star Wars™: Force and Destiny™ has introduced the Consular to your campaign, and Disciples of Harmony can expand their presence with adventures and diplomatic scenarios oriented specifically to put their skills to use. 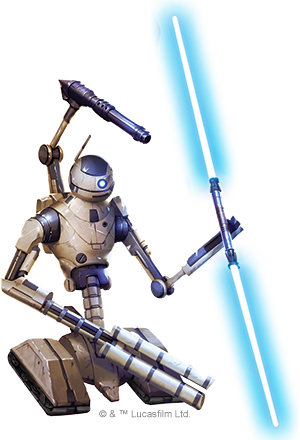 Expand the the capabilities of your Force users with new specializations, new Force powers, new gear, and new adventures with the Disciples of Harmony sourcebook, arriving in Q2 of 2017. Check back on our website for more information and previews of upcoming material.